How to get the maximum shine from your vehicle with white car wax! Black Car versus White Car – Which is Easier to Wax? Hi there! Matt here to give you the lowdown on the 2019 best wax for white cars. We recently wrote a guide on choosing wax for black cars and got a lot of requests to do a write-up for our friends with lighter colored rides that still want a great shine! As I’m writing this, it’s a hot, July, summer day here and it’s about 100*F outside. Needless to say it’s hot! So rather than working in the shop today, I figured I’d sit down and drop a knowledge bomb on ya’ll to help you find the perfect paste was for your ride. Are you aware that white paint doesn’t absorb much heat? White cars tend to be a bit cooler on those hot summer days compared to a black or gray car. If you have a white car, this article is perfect for you. Looks just like my old Mustang 🙂 Image source Six7777 – check out his great work on Flickr! Believe it or not, white cars are also not that difficult to maintain. I remember one of the cars I had in my younger years was a 1997 Ford Mustang 4.6L GT with a 5 speed transmission. It wasn’t the prettiest car because it was old and the paint wasn’t taken care of by previous owners. But let me tell you what, I almost never had to wash it and only waxed it a couple times a year and the paint still looked better than most black, or dark colored vehicles of the same age. I would rank black cars to be the hardest and toughest to maintain. We wrote an article about waxing a black vehicle, and they are no doubt harder to maintain than white cars. Here are my top choices for the five best waxes for white cars. Take note that even the top brands are offering white waxes that are specifically formulated for white cars. These products are pretty similar to waxes for black cars. The product contains pigments to further enhance the depth and clarity of white paint. But the truth is you can use any type of wax on white cars (except dyed waxes, obviously). This list of the best wax for white cars are personally chosen by me and are reputed to perform admirably on white paint. Here’s the summary of our choices! Keep reading for why I chose each of them. This is the product I was talking about earlier. The Meguiar’s White Paste Wax is formulated for white or light colored paint. But this product is not a pure wax. It is actually a polish and wax that contains essential micro cleaners to gently restore the brilliance of white or light colored paint. This trusted brand once again takes the #1 spot for an easy to apply paste wax. Thick consistency and brings out that deep, gloss shine that you expect from a high quality wax. If you’re vehicle is white or light colored, you cannot go wrong with Meguiar’s G6107. Apply it with an applicator pad or DA to your clean surface paint, in a cool place, and bring out that long lost shine! Because of the light pigments in the wax, it even hides impurities! 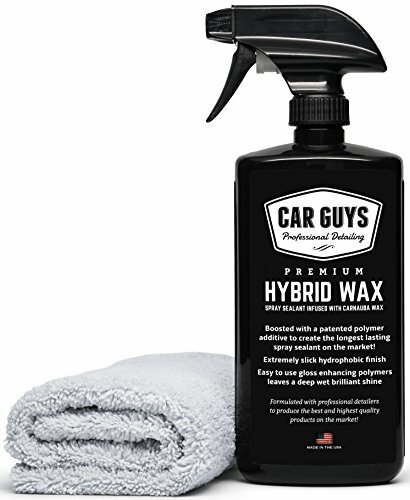 Can you use this product on a silver or gray car? Absolutely! Since white or light colored paint finish is prone to ugly stains or dark marks caused by severe dirt, tree sap, bird droppings, or asphalt, Meguiar’s was kind enough to infuse this product with gentle polishing agents so you can polish and wax your white car in a single step! I cannot really complain much about this wax. It’s a low cost, cleaner and wax that get’s the job done at a low price. Some old-school guys might not like it becuase it’s a synthetic blend, but I think this stuff is amazing. When it comes to shine, ease of use, and removing tough stains on white paint, it is hard to argue with what the Meguiar’s White Paste Wax can do for white paint. It remains to be one of the best wax for white cars that money can buy. If you’re looking for the absolute top quality wax, this is it! It\’s more expensive than Meguiar’s but is a pure Carnuaba wax that will shine up any ride and make the paint look better than factory. Granted, it’s a bit spendy, but how much is your paint worth to you? I learned of the wonders of the P21S Carnauba Wax when I saw my uncle waxing his beat-up pickup truck. Yes, his truck was white, but it was a dirty type of white. The truck may be old, but the paint was in relatively good condition. The secret? After many years of use and abuse, the white paint was protected by the P21S Carnauba Wax. This product is formulated using a special blend of pure carnauba wax and beeswax. It can be applied by hand or machine and is designed to buff out quickly without leaving tons of powdery residue. The best part? 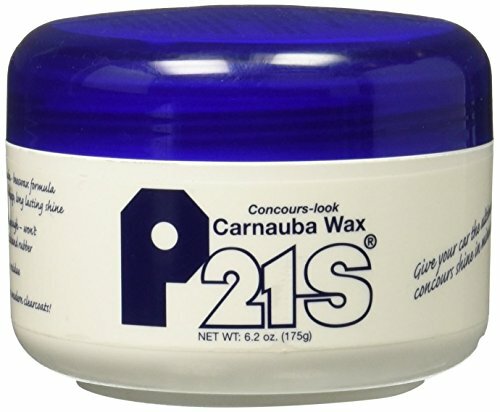 The P21S Carnauba Wax will not leave ugly white stains on emblems, plastics, and rubber. From that alone, I was astonished by the abilities of this rather basic paste wax. What I really like about this product is the amount of protection. I applied the wax by hand on my white Honda Accord and the water beads lasted for more than three months! No kidding! I found it hard to believe as well, but the P21S Carnauba Wax outlasted other popular brands in terms of long-term all-weather performance! This wax is not specially designed for white cars. You can use this product on black, green, orange, yellow, or red cars and you’ll most likely achieve the same results. My friend John came over and we tried this wax on his freshly polished ’12 Dodge Challenger Midnight Edition, and the results were amazing. The paint had a deeper and glossier shine and it was fantastically smooth to the touch. He went out and bought a jar the next day! Pro Tip Grab some Turtle Wax ICE and use it in-between applications for better protection and longer lasting wax! I do have minor caveats on the P21S Carnauba Wax. The formula is not powerful enough to remove light scratches or paint imperfections. If your white paint has stains, asphalt, or tree sap, you are better off polishing or using a clay bar before waxing the paint. This is not uncommon for waxes though. The proper steps for waxing is the first clean your car (with soap and water of course) with a clay bar and then a good polish before applying the wax. This product is also a bit more expensive than ordinary paste waxes. But when it comes to protection and shine, the P21S Carnauba Wax is definitely one of the best wax for white cars. I have said many times before that carnauba wax is the best wax in terms of shine. However, I firmly believe that polymer waxes have the edge in terms of protection. I’m not saying that polymer waxes are capable of outlasting carnauba waxes in rain or direct sun, but there is a marked difference in terms of clarity and shine. 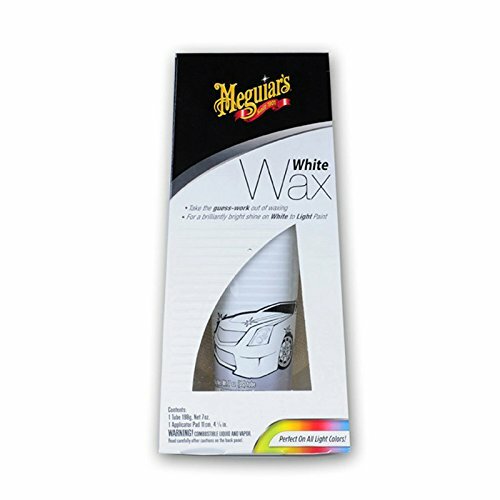 Another great wax from Meguiar\’s – basically it’s the same as the white wax, but doesn’t have the white pigments, so you can use it on all your vehicles – Easy to apply by hand and produces a beautiful, deep shine that will remind you of a show car. You cannot beat this “Ultimate Wax” – apply it with some applicator pads and prepare to have your socks blown off with how deep your vehicle paint shines! One fine example is the Meguiar’s Ultimate Paste Wax. 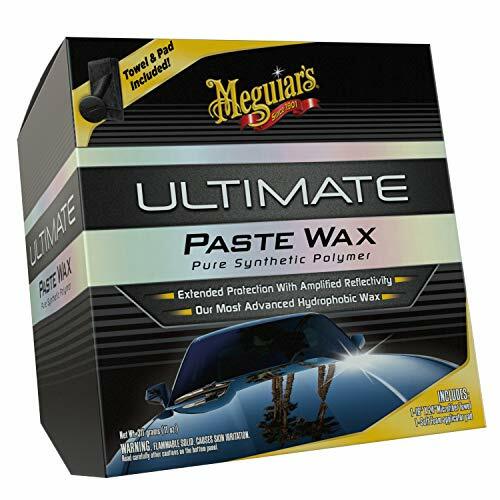 This is the most advanced hydrophobic wax (causes water to bead up) from the Meguiar’s staple of fine car care products and is formulated to offer superior protection, durability, and depth of color. This wax will work on any color of paint but it also performs quite well on white cars. The product is formulated utilizing Thin Film Technology and advanced synthetic polymers that form a lasting protective barrier to offer an incredible shine, whether on dark or light paint. Pro Tip Grab some Meguiar’s Gold Class Quik wax and use it in-between applications for better protection and longer lasting wax! This is one of the best wax for white cars because it offers superior and lasting water beading protection. In fact, most of the water beads will simply roll off after a fresh coat of this paste wax. As the wax degrades, the surface is still able to provide superior water beading so you can simply wipe off the water with a clean cloth. The Meguiar’s Ultimate Paste Wax can be applied by hand or by machine. It is also a bit more expensive than other carnauba-based waxes. 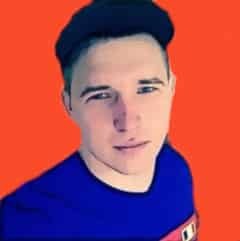 I’ve been using Formula 1 products for the past ten years. Are you familiar with the Johnson Kit Wax? This happens to be the same product, although it is reformulated for better protection and shine. It’s one of the best waxes for white cars for the price. Even though it’s one of the cheapest waxes I’ve used, believe me, it doesn’t skimp on quality. For a raw wax without any fancy added polishes or colors, this stuff is perfect. Low priced, goes on easy, brings out excellent shine! Make sure to apply it lightly or it’s a pain to remove! Is the price an indication of quality? Hardly. 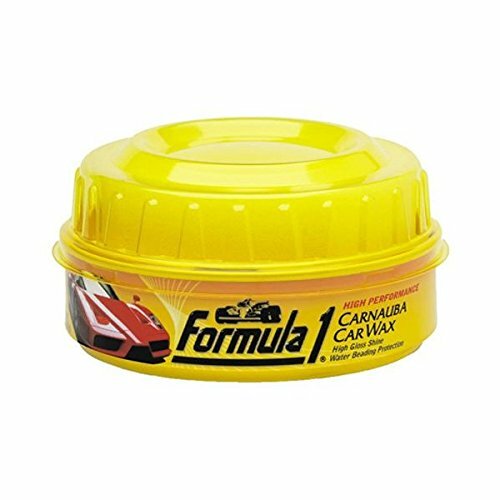 The Formula 1 Carnauba Paste Wax is not a pure wax. The formula contains advanced micro polishing agents that can remove light scratches and swirl marks on any color of paint. But unlike other polish and wax, the Formula 1 Carnauba Paste Wax is able to offer a deeper and superior shine. The formula will also revitalize tired and dulled paint finish and can easily remove light oxidation and tree sap without using a clay bar. Formula 1 states this wax can provide up to 12 months of protection. In my case, the wax started to degrade within a month or so, but the shine was still there. Of course, you have to consider the extreme weather conditions and the fact my cars are mostly exposed to sun, snow, and rain. I believe that periodic application of the Formula 1 Carnauba Paste Wax is the key to unlock the lasting protection of this wax. Excellent choice for paint that’s been maintained or people without much time to put into applying a paste wax. Just spray it on and wipe it off! You can complete a car in 15 minutes usually. I am not a big fan of spray wax or spray detailers. But when it comes to spray waxes for white cars, I do like the Car Guys Hybrid Wax Sealant. This is a polymer-based liquid wax that works fantastic when used in tandem with a polymer-based wax. It’s a spray wax so the protection won’t be as good as the paste or liquid waxes… but if you’re pinched for time, or lazy like Vince, then spray wax would be perfect for you. You can also use it in tandem with a paste/liquid wax to extend the protection without much extra work. Using a spray wax combined with a paste, I’ve gone 6 months and still kept a brilliant shine on my old Mustang. Not a complete wax solution and better to use alongside one of the other waxes listed. Back when I was younger, I was the designated car wash boy and detailer around my Dad’s shop, but it was a matter of choice. I found waxing or polishing cars to be therapeutic. It also gave me the chance to test a wide variety of products to determine which product is best for each application. However, my first real car happened to be painted black. It was the deepest kind of black available and it looked gorgeous when new. I really thought black paint was easier to clean than white paint. I was wrong. I was terribly wrong. I basically spent a large part of my adolescent life polishing and waxing my car. Since I didn’t have enough money for gas (my black car was a gas-guzzler), I simply burned my time and energy in waxing and detailing my ride. The problem with black vehicles and dark paint colors are swirl marks. Millions upon millions of microscopic scratches will present their ugly selves all over the hood, trunk, bumpers, and doors of your precious ride. What causes swirl marks? Swirl marks are primarily caused by dry surface abrasion. If you have a habit of wiping your dusty black car with a dry cloth, congratulations. You have given your paint swirl marks that will be permanently etched on the surface. This is unless you pre-clean and polish the surface or use wet sanding to remove deeper scratches and swirl marks.We wrote a guide on waxing and polishing your ride here. Black cars should be handled with care. You need to use clean and dry towels and applicator pads when applying or removing wax or polish. You will need to wipe off excess mud and dirt from the paint using a hose and a wet towel before washing the entire surface with car shampoo. However, white cars are different. In fact, I will rank white cars as the easiest to clean and maintain next to gray or silver cars. Provided that you wash (at least once a week) and wax (at least every 3 months) periodically, you can expect white paint to remain flawless and clean for many years to come. Another plus? Dust is not as obvious on white paint as it is on black cars. Nice, right? Paste wax. Ah, nothing like good old paste wax! I prefer paste wax over liquid or spray wax (see Paste Wax vs Spray Wax) although the liquefied version enables the product to apply smoothly over the paint. Paste wax is more economical to use since it is easier to dispense the proper amount of product on the applicator pad. Paste wax is also ideal for machine use. Liquid wax. This is the most popular type of wax and is preferred by the younger set of car owners. Liquid wax is easy to apply but you need to be careful when dispensing the product to the applicator pad. Spray wax. This my least favorite among waxes but it does serve a purpose. Nothing beats the convenience and shine of spray wax after you apply it to a freshly washed car. Try it. 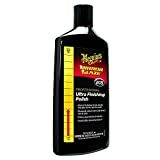 This is a great product to use in-between waxing or polishing to help refresh the shine and color of the paint. Read more about the Best Spray Wax. Properly using this stuff you can make your wax paste application only necessary once or twice a year! It doesn’t take too much work to maintain that flawless look of your white car. This list of the best wax for white cars will help keep, or restore your light colored vehicle to showroom condition! How Many Quarts of Oil Does My Car Need?